We are exci­ted to launch our quar­terly news­let­ter, which we plan to use to inform you about important deve­lop­ments with our Inves­tee-Part­ners (how we refer to our port­fo­lio com­pa­nies) and at bm|t. Chan­ges in data pro­tec­tion regu­la­tion (EU-GDPR), from 25 May 2018, require that you give con­sent to con­ti­nue recei­ving our quar­terly news­let­ter and event invi­ta­ti­ons. The­re­fore we would like to ask you to opt-in by cli­cking the but­ton in the e-mail you recei­ved. If you did not get our e-mail, you can regis­ter for the news­let­ter here. You can unsub­scribe at any time by cli­cking the link at the bot­tom of every e-mail news­let­ter. Before we dive in to the important activi­ties in Q1 2018, we wan­ted to take the oppor­tu­nity to shortly dis­cuss bm|t’s history, deve­lop­ment, and our vision with you. bm|t is cele­bra­ting its 15th bir­th­day this year and some pre­de­ces­sor organizations/funds date back over 20 years. This long and con­sis­tent pre­sence and the valu­able net­works that have been estab­lished have allo­wed us to build a strong posi­tion in Thü­rin­gen. For way of back­ground, several of bm|t’s early-stage funds are sup­por­ted with money from the European Fund for Regio­nal Deve­lop­ment, and in the past as part of this pro­gram Thü­rin­gen has qua­li­fied as a dis­ad­van­ta­ged region cha­rac­te­ri­zed by a ›mar­ket hole‹, mea­ning that it is belie­ved that public capi­tal is nee­ded to fill a void insuf­fi­ci­ently addres­sed by pri­vate capi­tal. Gene­rally, we believe that capi­tal flows rela­tively effi­ci­ently to oppor­tu­nity; howe­ver, our expe­ri­ence here in Thü­rin­gen does indeed belie this view, as across all the tech­no­logy lea­ding regi­ons of the world where we have invested we have never encoun­te­red such a high ratio of tech­no­lo­gi­cal pro­wess divi­ded by inves­tor awa­reness as we have here in Thü­rin­gen. There is no doubt that this excep­tio­nal com­bi­na­tion has many fac­tors dri­ving it, but clearly the history of the region and ope­ra­ting under ano­t­her eco­no­mic phi­lo­so­phy until 1989 has played a very large role in crea­ting this uni­que situa­tion. Indeed some of the relics from the time of a strong tech­no­lo­gi­cal infra­st­ruc­ture with little or no oppor­tu­nity for glo­bal dis­tri­bu­tion or capi­tal rai­sing are still pre­sent. Howe­ver, we are glad to report that we believe bm|t’s and others’ work to fill this mar­ket hole over the last twenty years has borne fruit and we now feel that great stri­des are being made in increa­sing inves­tor awa­reness for the tre­men­dous tech­no­lo­gi­cal pro­wess we are bles­sed to have in Thü­rin­gen. The main con­tri­bu­tion to that accom­plish­ment, of course, lies with our Inves­tee-Part­ners, who have become increa­singly savvy about how to package inno­va­tive tech­no­lo­gies into effec­tive and investa­ble com­pa­nies with com­mer­ci­ally-via­ble pro­ducts and ser­vices for the glo­bal mar­kets. Cer­tainly we in Thü­rin­gen still have a lot of wood to chop and defi­ni­tely have much room for impro­ve­ment and many oppor­tu­nities to bet­ter exe­cute on the assets that we have. Howe­ver, thank­fully we sense that Thü­rin­gen has made good pro­gress in clim­bing out of our ›mar­ket hole‹ and are now that much stron­ger for it. bm|t has expe­ri­en­ced many value crea­ting invest­ments and exits over the years, but two from last year per­fec­tly high­light the pro­gress Thü­rin­gen has made in terms of beco­m­ing attrac­tive for glo­bal invest­ment. Being the lead inves­tor and lar­gest share­hol­der for fayteq’s sale to a Sili­con-Val­ley based social media giant and for InflaRx’s Nasdaq IPO were cathar­tic events in our deve­lop­ment here at bm|t. We also believe stron­gly that these hap­pe­nings are just the tip of the spear, and that Thü­rin­gen has many more com­pa­nies that will expe­ri­ence simi­larly impac­t­ful deve­lop­ments in the com­ing years. Of course, we, like nearly all inves­tors, have had some hard lear­nings along the way and some funds expe­ri­en­ced a lon­ger and deeper J-Curve than we would have expec­ted before tur­ning shar­ply up recently. We are cer­tainly bet­ter inves­tors now for those valu­able lear­nings and believe that our posi­tion in Thü­rin­gen and other con­di­ti­ons for invest­ment suc­cess have never been bet­ter. These deve­lop­ments give us signi­fi­cant con­fi­dence as we pur­sue our mis­sion and vision. We streng­t­hen Thüringen’s Eco­nomy through tar­ge­ted Invest­ments in inno­va­tive and growth-ori­en­ted com­pa­nies with high poten­tial. In the pur­suit of this mis­sion and vision we have cho­sen the fol­lo­wing three key values to guide our thin­king and actions: Trans­pa­rency, Inte­grity, and Crea­ti­vity. We com­mu­ni­cate openly with our part­ners and expect the same from them. We strive for all par­ties to a tran­sac­tion to have a com­plete under­stan­ding and accep­tance of all terms and con­di­ti­ons. We act with a part­nership men­ta­lity and in the inte­rest of bm|t’s mis­sion. We have high qua­lity expec­ta­ti­ons, and all poten­tial invest­ments are ana­ly­zed with the same stan­dards. We believe in ideas and the actions that turn ideas into rea­lity. We don’t know what the future will bring, but we do know that tog­e­ther with our Inves­tee-Part­ners we can shape a bright and sustainable future. In con­clu­sion, it’s been a quite pur­po­se­ful and event­ful jour­ney at bm|t over the past 15 years, and we believe many posi­tive trans­for­ma­ti­ons have occur­red such that we are well posi­tio­ned for sustai­ned strong per­for­mance in the years ahead. Import­antly, we at bm|t under­stand our role as inves­tors, col­la­bo­ra­tors, enab­lers, and sup­por­ters for the main value crea­tors for Thü­rin­gen, our Inves­tee-Part­ners. We’re extre­mely proud of the port­fo­lio of Inves­tee-Part­ners that has been built over 15+ years and view it as having excel­lent invest­ment poten­tial. We’re loo­king for­ward to con­ti­nuing to work with all part­ners to create more suc­cess sto­ries made in Thü­rin­gen. 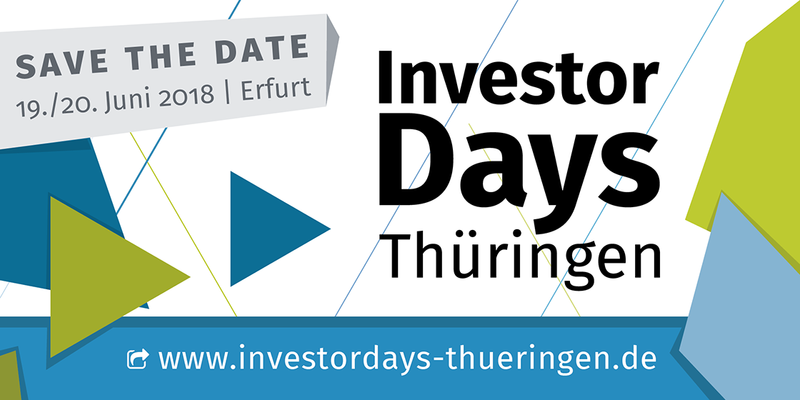 If you would like the chance to see over 40 inno­va­tive com­pa­nies pre­sent their sto­ries and invest­ment cases please attend the upco­m­ing Inves­tor Days Thü­rin­gen event on June 19th and 20th in Erfurt. This year nearly bm|t’s ent­ire port­fo­lio will be pre­sen­ting on June 20th. If you’re an inves­tor you will defi­ni­tely want to wit­ness for yours­elf the com­pel­ling, under-the-radar invest­ment oppor­tu­nities we have here in Thü­rin­gen. We’re loo­king for­ward to see­ing you next month! In Q1 we clo­sed a new invest­ment in Bia­noGMP, a com­pany with an intri­guing history to its for­ma­tion and com­pel­ling mar­ket oppor­tu­nities that should be quickly address­able. The foun­ders, Dr. Tobias Pöhl­mann and Dr. Rolf Gün­ther, while deve­lo­ping their own RNA-based medi­ci­nes at Bia­no­Sci­en­ces, encoun­te­red the chal­lenge that con­trac­ting out small-batch oli­gonu­cleo­tide pro­duc­tion was extre­mely expen­sive, even pro­hi­bi­tive in some cases, for smal­ler bio­tech com­pa­nies. The foun­ders deci­ded to put their strong sci­en­ti­fic back­ground to work and star­ted Bia­noGMP in order to address this pro­blem of overly expen­sive out­sour­ced small-batch oligo pro­duc­tion. The com­pany and we believe BianoGMP’s offe­ring will quickly reso­nate well with a myriad of custo­mers that face the same chal­lenge as Bia­no­Sci­en­ces. Wel­come to the family and all the best for BianoGMP’s future suc­cess. We’re loo­king for­ward to this jour­ney with you. bm|t is plea­sed to announce that 2018 is off to a strong start for capi­tal rai­ses with seven Inves­tee Part­ners having already clo­sed finan­cing rounds in the first quar­ter of the year. Over 10M EUR was rai­sed by Biano GMP, ife­sca, JenID, Mas­ter­PIM, OnC­Gnostics, Pre­ven­ti­cus, and SiOp­tica, secu­ring the necessary finan­cing for important, value-dri­ving advan­ce­ments. These invest­ment rounds con­ti­nued the strong momen­tum from 2017, in which over 150M EUR was rai­sed by 21 of bm|t’s inves­tee part­ners. We view the con­ti­nua­tion of the fund rai­sing momen­tum as a great sign for Thü­rin­gen and a strong signal to the invest­ment com­mu­nity of the attrac­tiveness of inves­ting in the region. Of par­ti­cu­lar note was that two of the first quar­ter finan­cings attrac­ted mul­ti­ple mil­lion Euros from out­side of Ger­many, with one invest­ment com­ing from Switz­er­land and ano­t­her from Bel­gium. We’re delighted to see that inter­na­tio­nal insti­tu­tio­nal inves­tors are increa­singly reco­gni­zing the com­pel­ling invest­ment oppor­tu­nities here in Thü­rin­gen.